Alan Pauls, one of Latin American literature’s rising stars, combines the intimate and the political in a novel that, although it is set in Argentina in the 1970s and ’80s, will bring to mind books like Choire Sicha’s Very Recent History and Sam Lipsyte’s The Ask in its subtle, brilliant depiction of the place of money in its protagonists’ lives. It begins with a body: a top executive of an iron and steel company dies after his helicopter, travelling toward the factory where he is due to meet with striking workers, plummets into the river. The briefcase full of money which he was carrying disappears without a trace. Accident, or assassination? And where is the money? 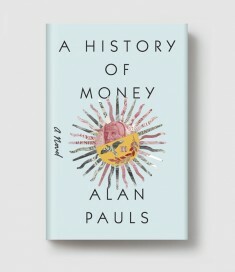 A History of Money revolves around this event, as does the imagination and memory of the unnamed protagonist of the novel, who returns over and over to it even as he reflects on the role of money in his family and his own life. His parents are divorced: his father is a gambler who plays in all-night poker games and carries around all of his money in a wad of cash; his mother is a socialite who squanders her inherited fortune on a lavish lifestyle. Our protagonist, for his part, pays—in every sense of the word. And his individual story is echoed in the larger story of Argentina in the 1970s and ’80s, where money is everything: promise and punishment, dream and distaste. Born in Buenos Aires in 1959, ALAN PAULS is a novelist, as well as a film and literary critic and essayist. He has worked as a professor of literary theory at the University of Buenos Aires and an editor for the daily paper Página/12. He also founded the magazine Lecturas Criticas. His novel The Past received the prestigious Herralde Prize in 2003 and was made into a movie starring Gael Garcia Bernal. ELLIE ROBINS is a translator from Spanish and has worked in publishing in the US and the UK.